The Boss then advices the listener not to waste his or her time waiting, before launching into the chorus. And like usual, when Springsteen preaches from his pulpit, I’m a sycophant in the choir. “Badlands” had to be ringing in my ear when, a few months back, my wife called from work to inform me that Fleetwood Mac was coming to town on April 6. Having been to hundreds of shows, and seeing many bands I could take or leave (Loverboy? Duran Duran? ), it was astonishing that I missed one that had been among my absolute favorites since, like, sixth grade. How was it that our paths never crossed? In the mid-1970s, when I was wearing the grooves out of “Rumours,” I was not old enough to go to concerts. Once I was, I suppose the timing was off. Either they came in the summer, when I was away at overnight camp, or in the winter when I was busy with hockey. Whatever the reason, the comedy of errors needed correcting. Reaching age 48, and with the sands running through the hourglass, it would be fair to place seeing Fleetwood Mac on my bucket list. And I didn’t want to spend my life waiting for that moment that wouldn’t come. The reality is that these bands are not going to be touring forever, so we have to be prepared to live in the moment. My wife had her moments of doubt and pain, considering letting me go with a friend when the odds getting a baby sitter who could work post-midnight seemed dim, but I was able to corral one. I was more than a little perturbed to learn the Phillies had a game at 7, which would be sure to cause traffic headaches when trying to reach the Wells Fargo Center for a scheduled 8 p.m. concert. We left the house earlier — and wove through a little bit of traffic congestion, made worse by that stupid Xfinity thing — but landed in a parking spot well before the doors to the arena were even opened (despite the fact that the Phillies fans were taking up their share of Wells Fargo spots). Still, despite my anxieties, this was a night when everything was going to continue to fall in place — from the shirt to the sandwich to not having Mr. and Mrs. Abdul-Jabbar sitting in front of us. Not a lot of sitting around and waiting, either. There was no warm-up band, and the concert started right around 8:15. And seeing this band I had loyally followed for decades, while loving and leaving many others along the way, hit the stage sent a surge of teen-aged adrenaline through my middle-aged body. It was cool to see Mick Fleetwood sit behind his vintage drum kit, John McVie on bass and Lindsay Buckingham on guitar. But nothing matched the vibe of taking in the sight of the one and only Stevie Nicks, dressed in vintage attire, prancing onto the stage — tambourine in hand — and approaching the microphone. As legendary female singer/songwriters go, she is unmatched in my book — and it is a thick book that also includes since-retired Fleetwood Mac songbird Christine McVie (John’s ex-wife). What is amazing about Nicks, beyond the collection of lasting songs — both with Fleetwood Mac and solo — is that men and women both have a love affairs with her. Best explanation, beyond the obvious-but-superficial fact that she is hauntingly beautiful, is that it is because she is true to herself. Not perfect, as her trials and tribulations reveal, but a real person with a real message that resonates. I enjoyed every chord of every song last Saturday night. I was particularly enthralled by Buckingham’s chops on guitar. I always knew the guy was good, as evidenced by his appearance on those oft-silly top 100 guitarist lists, but he was amazing. It was one of the best non-Springsteen concerts I have seen, living up to every expectation. 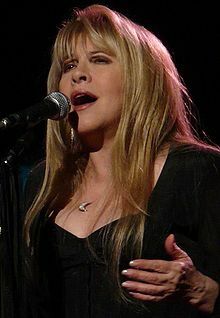 With all due respect to Buckingham as a songwriter, the Stevie Nicks-penned songs – from “Dreams” to “Rhiannon” to “Landslide” to “Gold Dust Woman” – had me as entranced as I was when I was hearing them for the first time. They all had newness to them, and yet the nostalgia could not be lost. There was not a Stevie Nicks song — poetry set in motion — where tears didn’t well up in my eyes. I must admit that it seemed surreal, almost like a dream sequence, and that I was going to wake up at a Barry Manilow concert. But, it was the real deal. I was in the same building with Stevie Nicks, Gordonville’s High Priestess of Rock and Roll. When I was able to take my eyes from stage, I glanced around the building. I watched the people naturally moving with her songs, with their arms seemingly taking flight on a magical and mystical journey that brings you back home again, feeling more in touch with your soul, when you return. It’s not far removed from the theory of loving and letting go of someone — or something — you love, and if it returns, it means it loves you back. Stevie Nicks, though her music, love us back. There is no formula for doing this to an audience. Some artists try and try, and just can’t create this reaction. For others, a precious few, it is a gift. We should all be thankful for receiving it. This entry was posted in Music on August 13, 2013 by gordonglantz.